Iris's cousin Gavin coined this nickname for her a year ago when his family was here visiting, and although when he christened her she was largely non-verbal and did not have a color preference, she has recently made her opinion known and thrown her hat firmly into the "pink" ring. I'm not really much of a pink girl myself, and I was secretly delighted when Eve turned out to be a dyed-in-the-wool yellow fan. But I'm not such a Scrooge that I can't put my personal bias aside and let the little princess have her rosy way. I found a fantastic solid wood nightstand at Goodwill a couple of weeks ago for $7.99, and it was so perfect for the girls' room that I didn't even wait for half-off day to see if it was still there. (Livin' large, people, livin' large.) I snapped it up and took it promptly to Natalie of Natty By Design for a makeover. I've refinished furniture before, with varying results, but this time I wanted the real deal. This piece gets a lot of action: it holds all the Barbie stuff, so it's a very popular Dixon girl destination. Natalie did a fantastic job, filling all the little dents and dings, and she's got a fancy sprayer that I just can't compete with. She even hooked me up with free vintage hardware that she had laying around from another project, and it was totally the right move. 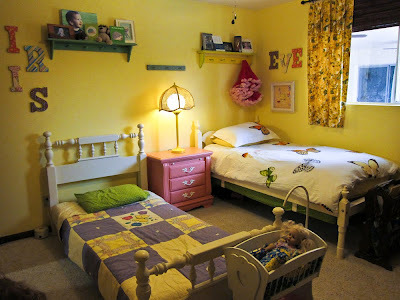 I was going to have it painted cream like the girls' beds, but when I showed up at her house, Nat had a wild idea. And I love a wild idea. it's pink! Peony from the Martha Stewart line from Home Depot. Isn't it absolutely perfect? If you want to see before and after shots (and trust me, you do) then hop over here. I did my best, but her photo skills are off at Harvard and mine are still drinking out of a sippy cup, if you know what I mean. The girls love it, I love it, and if you've got an ugly piece of furniture laying around that needs some oomph, I promise you will love her work too. Thank you, Natalie, from Little Pink Iris and me! Ooh la la I love it! The before/after shots were fabulous! What a change! You're fab! The girls' room is darling. Love, lovidy, love, LOVE!!! You DID get a steal of a deal. She did a great job. This is AMAZING!! I can't believe that's the same dresser! It must feel so fancy after thinking its life was over! Wow wow wow. SO adorable!! Ooh, if you're going for a streamline change, how about solid peony drapes, maybe floor length to match the new dresser? Huh, huh? It's just such a GREAT color. Do you think you'll keep the bedding as is? Fun fun! I agree with Emily. 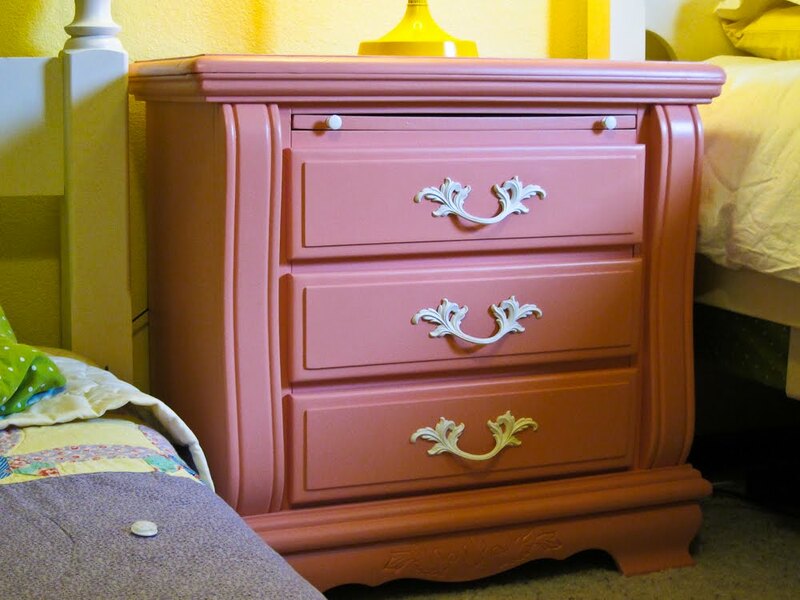 The dresser looks fabulous, and some matching drapes would be just the ticket. My girls have spent the entire time our house has been delayed trying to merge a PINK girl with a turquoise girl. I keep telling them that it is entirely possible, and will be darling, and I'm not getting involved!